Nearly 10 years ago I put together an article on a new defunct blog of mine covering the rivalry. games of the year 2009. I’ve decided I’m going to revive the article and do some minor tweaking. For your reading pleasure, I present to you, Rivalry Week 2009. This game did not see play during Rivalry Week. Since then Missouri has moved into the SEC and got to play a wonderfully exciting game against what is most likely the worst Arkansas football team in the school’s history. Hopefully they’ll get this game back on the schedule for next season. Next on the list we have the Iron Bowl. 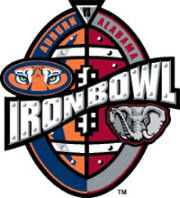 For those of you not around the south, the Iron Bowl is THE rivalry of rivalries. When people think of Alabama playing against Auburn, they equate it to things such as the North fighting against the South… The Axis versus the Allies… some even go as far as to compare it as the battle of good and evil. It gets intense around here and some people tend to get hurt while waiting for the weekend or in this horrid case because of CBS wanting to grab some ratings, Friday to come around for the game to be played to give the fans the bragging rights they have truly earned. The series originated in 1893 with the two schools playing against each other in Birmingham, Alabama (that’s where the iron came from). The Crimson Tide currently lead the rivalry 45-36-1. Auburn took the W last season but with little comfort as the Tide went on to win the National Championship. 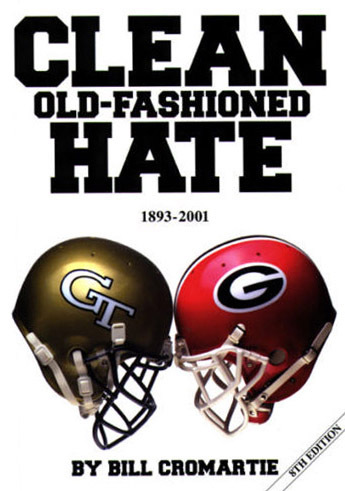 Now I bring you “Clean, Old-Fashioned Hate”. Words that could only be used to describe the Georgia vs. Georgia Tech game. The rivalry between these two schools also began in 1893. The heated rivalry goes all the way back to truthfully 1891 when UGA began to mock Tech for its choice of school colors. The fire only burned stronger as time passed by with UGA once again offending the Yellow Jackets in 1919 by having a parade celebrating UGA’s return to football while making fun of Georgia Tech students for continuing to play football during war time. With only 70 miles between the schools (UGA in Athens, and GA Tech in Atlanta) the schools are in constant competition against each other not only for recruits, but for state funding and for recognition from their home state as well. The winning school of the years football game receives the Governor’s Cup Finally, I just really like the name given to this rivalry. Next up on the Rivalry list we have the Texas Longhorns, and the Texas A & M Aggies. These being the two oldest public schools in the state of Texas, their rivalry is a natural one. 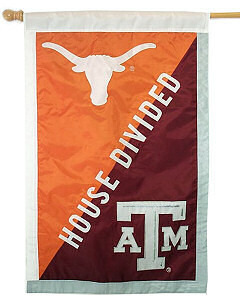 Texas and A & M have been competing against each other since 1894, but their rivalry has been adjusted to spread bragging rights based on all sports rather then just football. in 2004 a points system was introduced. Points are awarded for all sports in which both schools maintain an intercollegiate team. Each sport is worth one point, which is awarded to the winner of the head-to-head matchup between the two teams. If the head-to-head matchup ends in a tie, each team receives ½ point. In baseball, the team that wins the regular season three-game series is awarded one point. In sports where the teams meet twice during the season — currently softball, volleyball, and men’s and women’s basketball — each contest is worth ½ point. If the universities do not compete in head-to-head regular season competition, the university that places higher at the Big 12 Conference Championship will earn the point. Should the universities tie in Big 12 Conference Championship competition the point will be split between the two schools. In the sport of track and field, multi-school meets do not count as head-to-head competition. There are a total of 19 possible points, with 10 points needed to win. In the event of a 9½ to 9½ tie, the winner of the previous year will retain the title for the following year. Since A&M has left for the SEC, Texas has removed A&M from their schedule. I wonder if Jimbo Fisher could get this rivalry going again. And for the next big game, we have Virginia Tech at Virginia playing for the Commonwealth Cup. This match up rolls back to 1895 when the schools started playing each other. From what I’ve gathered, aside from just a game between people from really close places to each other, there’s not much to this. With the Va Tech Shooting, the rivalry became even less intense. Many fans on both sides of the rivalry have reported a lessening of hostilities between the two universities while maintaining the same intensity of the rivalry in the wake of the Virginia Tech Massacre. According to The Washington Post “students in both camps are more apt to think of themselves as simply Virginians.” UVa students were amongst the first university students to lend support to the comrades at Virginia Tech in the wake of the shootings. Likewise, the connections between the two university’s populations are often very close. Prior to the 2007 football contest in Charlottesville both college’s bands participated in a joint performance. 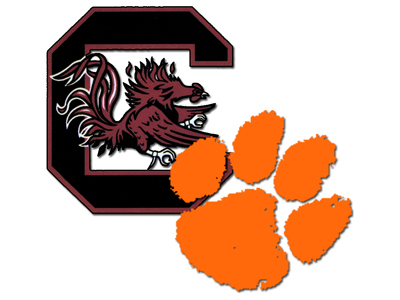 However, the intensity of the rivalry was still as spirited as ever, with both sides cheering passionately for their own team as a berth to the ACC Championship game was on the line. “…there was the sense among Tech students that fans of U-Va. – an institution founded by none other than Thomas Jefferson – looked down their noses at the mountain-ensconced Hokies of Blacksburg. Hokies were “hicks”; Cavaliers were “snobs.” But after the shootings in April, something changed. U-Va. students and faculty members wrote condolence letters, held a candlelight vigil and even painted the campus’s fabled Beta Bridge with a pro-Hokies phrase.” — Jonathan Mummolo, The Washington Post U-Va.’s student newspaper reported that students in Charlottesville were even sporting Hokie sweatshirts on occasion in observance of the tragedy. The University’s Z Society went so far as unveiling a 65′ x 120′ Virginia Pride flag featuring both UVA and VT logos on it during the annual football game, and it was noted that the two fan bases had never been so close as they were after the shootings. “Since the tragedy, it hasn’t been so odd to see a Wahoo wearing a Virginia Tech sweatshirt. Since April, transfer students haven’t felt so awkward saying they used to attend school in Blacksburg. Truly, Hokies and Wahoos have never been so together.” — Eric Kolenich, The Cavalier Daily. Next up on the list is Pittsburgh playing at West Virginia in The Backyard Brawl. This rivalry rolls back to 1895 when the first game was played. The rivalry basically exists because, you guessed it, the schools are basically in each other’s back yard. Pittsburgh currently leads the series 61-37-3. The 1921 edition of The Backyard Brawl was the first football game to be broadcast over the radio airwaves. Other than the 2007 Pitt team knocking the then number two ranked West Virginia out of the BCS National Championship game, there hasn’t really been much to fuel this rivalry then, they’re competing for the same stuff as GA-GA tech. As other things have changed since 2009 so has this rivalry game. This year West Virginia played Oklahoma during rivalry week. Mississippi A&M featured practical training without unnecessary studying of the liberal arts. Mississippi A&M provided poor students work-scholarships so that they could attend the college. There were too few students who studied agriculture at the College to justify an agriculture college there. The College was a place “for the sons of lawyers and of the well-to-do” who sneered at the agriculture students as if they were hayseeds. The students at the College lived a life of luxury as compared with the sweat and toil endured by students at Mississippi A&M. There was not enough farm land near the College to allow for proper agriculture study. The most advanced agriculture educational research was being conducted at the University of California and at Cornell University, both of which combined agriculture colleges with liberal arts colleges. Additionally, a separate agriculture college would be more expensive and result in an inferior product. The work scholarships attracted the lowest quality of students who only cared about obtaining a college degree, not about an education in agriculture or mechanical studies. Furthermore, there was little advantage of attending a college only to pitch manure and grub stumps. The constant attacks by Tillman on the College caused many to doubt whether state support for the institution would continue. As a result, the enrollment numbers were not impressive, although the numbers of students taking agriculture and mechanical classes increased from 34 in 1887 to 83 in 1889. Over half of the students at the College were the sons of farmers, though most did not study agriculture as Tillman wished. John McLaren McBryde, President of the College, correctly predicted that most students of an agriculture college would not go back to work the farm after graduation. While some students at the College were the sons of the well-to-do, the majority were poor.Tillman was bolstered in 1886 when Thomas Green Clemson agreed to will his Fort Hill estate for the establishment of an agriculture college. Yet, Tillman did not want to wait until Clemson died to start a separate agriculture college so he pushed the General Assembly to use the Morrill funds and Hatch funds for that purpose. Instead, the legislature gave those funds to the South Carolina College in 1887 which would use them along with a greater state appropriation to reorganize itself as the second University of South Carolina and to also greatly expand the agriculture department. After this victory for South Carolina, in January 1888 Tillman wrote a letter to the News and Courier that he was retiring from public life.It was less than ninety days when Tillman reemerged on the scene upon the death of Thomas Green Clemson in April 1888. Tillman advocated that the state accept the gift by Clemson, but the Conservatives in power opposed the move and an all out war for power in the state commenced. The opening salvo was fired by Gideon Lee, the father of Clemson’s granddaughter and John C. Calhoun’s great granddaughter Floride Isabella Lee, who wrote a letter on her behalf to the News and Courier in May that she was being denied as Calhoun’s rightful heir. Furthermore, he stated that Clemson was egotistical and “only wanted to erect a monument to his own name.”In November, Lee filed a lawsuit in Federal Court to contest the will which ultimately ruled against him in May of 1889.The election of 1888 afforded Tillman an opportunity to convince the politicians to accept the Clemson bequest or face the possibility of being voted out of office. He demanded that the Democratic party nominate its candidates by the primary system, which was denied, but they did accept his request that the candidates for statewide office canvass the state. Tillman proved excellent on the stump, by far superior than his Conservative opponents, and as the Democratic convention neared there was a clear groundswell of support for the acceptance of Clemson’s estate. He was so effective because of his “ability to awaken popular passion and prejudice” when the populace by and large mistook “prejudice for truth, passion for reason, and invective for documentation.” Tillman pitted “the poor against the rich, tenant against landowner, hireling against employer, country against town, all of South Carolina against Charleston and Columbia, upcountry against lowcountry, white against black, do-somethings against do-nothings, and outs against those in power” so that “he could rile them up and then appear as their champion.” In addition, the Conservative leadership was aging and its appeal to the past glories of South Carolina during the antebellum period meant little to the emerging younger generation.Tillman explained his justification for an independently controlled agriculture college by pointing to the mismanagement and political interference of the University of South Carolina as had occurred during Reconstruction. The agriculture college, as specified in Clemson’s will, was to be privately controlled and thus would be able to prevent any “possible invasion by the negroes”. With declining cotton prices, Tillman preyed upon the farmer’s desperation by stating that the salaries of the college professors were exorbitant and it must be a sign of corruption. Consequently, the legislature was compelled to pass the bill to accept Clemson’s bequest in December of 1888, albeit with the tie-breaking vote in the state Senate from Lieutenant Governor William L. Mauldin. Thus was reborn the antagonistic feelings of regional bitterness and class division that would plague the state for decades. Having achieved his agriculture college, Tillman was not content to sit idly by because what he really desired was power and political office. After winning the 1890 election and becoming Governor, Tillman renewed the attacks on the Conservatives and those who had thwarted his agriculture college. He saved the coup de grâce for Senator Wade Hampton III, a South Carolina College graduate and Confederate General during the Civil War, who “invoked Confederate service and honor as a barrier to Tillmanism.” Tillman directed the legislature to defeat Hampton’s renomination for another term in December of 1890, thereby finishing what Sherman had left undone in 1865.While campaigning for Governor in 1890, Tillman leveled his harshest criticism towards the University of South Carolina and threatened to close it along with The Citadel, which he called a “dude factory.” Despite the rhetoric, Tillman only succeeded in reorganizing the University of South Carolina into a liberal arts college while in office. It would eventually be rechartered for the last time in 1906 as the University of South Carolina. However, Clemson Agricultural College held sway over the state legislature for decades and was generally the more popular college during the first half of the 20th century in South Carolina. The rivalry started in 1896. Next up, the Colorado State – Wyoming Border War. Nothing is really special about this rival aside from rivalry based on location. In 1968, the ROTC detachments of the respective schools initiated the Bronze Boot, a traveling trophy awarded to the winner of the “Border War” each year. The boot was worn in the Vietnam War by Cpt. Jeff Romero, Sr., a Colorado State graduate and Army ROTC instructor at CSU between 1967 and 1969. Each year leading up to the Wyoming-Colorado State game, the game ball is carried in a running shuttle relay by the ROTC detachment of the visiting team down US 287 to the Wyoming-Colorado state border, where the home team’s ROTC detachment receives it and runs the game ball to the stadium hosting the game. The trophy is guarded by the ROTC unit of the past year’s winning school during the game. This game was played on October 26th this year. Wyoming took the W.
Off now to the Duel in the Desert and the Territorial Cup. The “Territorial Cup” also known as the “Duel in the Desert” is the rivalry between ASU and UA and is among the nation’s oldest and most heated rivalries, including the oldest trophy in college football. The winner of the game is then given possession of the Territorial Cup until the game is played the next year. In the modern era of the game, it is played on the day after Thanksgiving (and in recent years on the Saturday after Thanksgiving to accommodate network television coverage). The rivalry dates back to before Arizona was admitted as a state, and was a U.S. Territory. In the early history of Arizona, a resentment between the cities of Phoenix and Tucson emerged. The University of Arizona was founded in 1885 as the state’s first university. The same year, Tempe Normal School was founded as a small teacher’s college in the farming community of Tempe, just east of Phoenix. Over the years, Tempe Normal School evolved into Arizona State Teacher’s College, then Arizona State College at Tempe, and eventually Arizona State University. Although both athletic programs have been consistently in the top 20 in the Director’s Cup standings for the past decade, the two schools have featured a difference in athletic strengths. The rivalry started in 1899. The Bedlam Series is, like most other intrastate rivalries, a rivalry that goes beyond one or two sports. Both Oklahoma and Oklahoma State have rivalries with other schools, though most of those rivalries are limited to one or two sports at the most. When the Bedlam Series gained Ford and the Bank of Oklahoma as corporate sponsors, the series became much more formalized. A points system was adopted in order to award a winner of the all athletic competitions combined between the two schools. A crystal bell trophy is awarded to individual Bedlam game winners (such as football), in addition to a trophy for the overall series champion for that year. The “Bedlam Bell” is modeled after the bell clapper in Old Central, the oldest building on Oklahoma State’s campus. For a time, the actual bell clapper was a traveling trophy for the two schools, until the popularity of this tradition waned. Like many other things since 2009, things have changed. This game was played on November 10th with Oklahoma edging out the W.
Moving on, we have the Washington-Washington State rivalry. This one seems so boring that I’m just going to use the Apple Cup Wikipedia entry to fill this slot in. 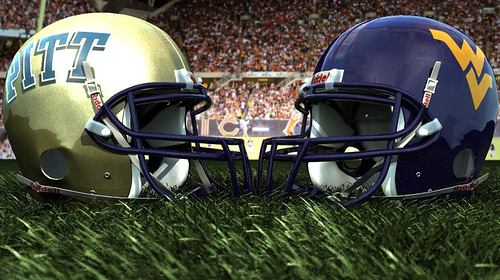 The Apple Cup is the annual college football rivalry game between the two largest universities in the U.S. state of Washington; the University of Washington (UW) Huskies and the Washington State University (WSU) Cougars. It is traditionally the final game of the regular season and takes place on the Saturday preceding Thanksgiving at Husky Stadium in Seattle during odd years, and WSU’s Martin Stadium in Pullman during even years. From 1950-80 (except for 1954), WSU hosted the game at Spokane’s Joe Albi Stadium. The WSU Cougars won three of these fifteen games in Spokane (1958, 1968, 1972), and have won six of the fourteen played at Martin Stadium (1982, 1988, 1992, 1994, 2004, 2008).Before 1962, the teams played for the “Governor’s Trophy.” The game was renamed the “Apple Cup” in 1962 because of Washington’s famous apple crop. The Apple Cup trophy has been awarded to the winning team ever since. With the recent lengthening of the regular season schedule to 12 games, there was a movement change the date of the Apple Cup from the weekend before Thanksgiving to the weekend following. This would have allowed a bye week sometime during the season. In the 2006 season, both teams played 12 straight weeks without a break, leaving the two teams noticeably fatigued. For the first time, the 2007 edition of the Apple Cup was played two days after Thanksgiving. 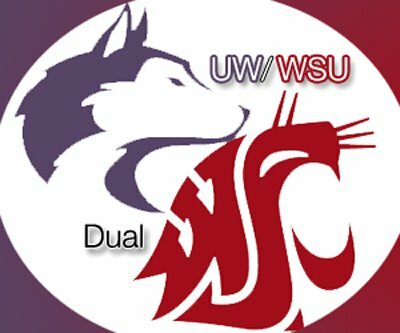 The Apple Cup has been sponsored by Boeing since 2007.The first rivalry game was held in 1900 and resulted in a tie between UW and WSU. From 1900 to 2008, there have been 101 games between the schools. The Huskies hold a 64-31-6 advantage. UW’s longest winning streak has been eight games, achieved twice: (1959-66 and 1974-81). WSU has never won more than two consecutive Apple Cups, but the Cougars have won back-to-back games on eight separate occasions: (1929-30, 1953-54, 1957-58, 1967-68, 1972-73, 1982-83, 2004-05 and 2007-08). This game was played on Friday with Washington getting the W.
With the Mississippi State vs. Mississippi Egg Bowl I was expecting more of a feud to have started the rivalry then anything else. So, with the same boring info I bring you more Wiki info. Early in the series, Mississippi State dominated, and had only lost five times in the first twenty-three contests. When Ole Miss beat MSU, then known as Mississippi A&M College, 7-6, the Ole Miss fans rushed the field, some trying to tear the goalposts down. A&M fans did not take well to the Ole Miss fans celebrations, and fights broke out. Some A&M fans defended the goal posts with wooden chairs, and several injuries were reported. To prevent such events in the future, students of the two schools created the “Golden Egg”, a large trophy which has been awarded to the winning team each year since 1927. The trophy is a large football-shaped brass piece mounted to a wooden base and traditionally symbolizes supremacy in college football in the state of Mississippi for the year. The footballs used in American football in the 1920s were considerably more ovoid and blunter than those in use today and similar to the balls still used in rugby; the trophy thus, to modern eyes, more resembles an egg than a football. The awarding of the “Golden Egg” was instituted in 1927 by joint agreement between the two schools’ student bodies. Mississippi State took the egg home this year. Next up we got the Toledo – Bowling Green Battle of I-75. This one is a little more interesting then the last ones (enough that I’m not just going to give you stuff from the Wiki then be done with it.) These two schools are only about 20 miles apart from each other, making the pressure to get recruits and fans from the local area much harder then some others. The winner of the battle is awarded the Peace Pipe Trophy (yep that’s right, a Native American peace pipe). The rivalry between UT and BGSU goes back to 1919. The games were (and to an extent still are) marked by a passionate fan following and a hatred for the respective opponent. In 1935, fans rioted following a 63-0 blowout win by UT and as a result, BGSU removed the Rockets from their athletic schedule until 1947. That year, the smoking of a six-foot peace pipe was instated as a gesture of goodwill between the two teams at half-time of their annual basketball match. The peace pipe would be kept by the winning university until the teams played again the following season. The tradition came to an abrupt and unpleasant end in 1969 when the pipe was stolen from the UT offices. It was never recovered and the thief never caught. In 1980, the Peace Pipe trophy was reinstated when a scale-down replica was fashioned and placed on top of a trophy created by former UT football player Frank Kralik. Kralik donated the trophy to the university to be given to the winner of each year’s football game, which like many other college football rivalries is usually the last game of the regular season for both teams. Nowadays, ESPN annually broadcasts the Peace Pipe game, allowing it to reach a wide audience outside of northwest Ohio. Though the two schools play in different divisions in the Mid-American Conference, they have yet to meet in the MAC Championship Game. This game got moved way away from Rivalry Week. It was played on October 6th with Toledo taking the W.
With the next teams and their rivalry, I hold little interest in. The fact that they are 12 miles apart and both in the same city, I find entertaining, aside from that, more Wiki read. 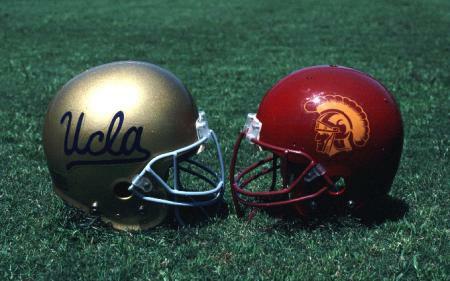 The UCLA–USC rivalry is the college rivalry between two universities located in Los Angeles, California: the University of California, Los Angeles and the University of Southern California.The athletic competition rivalry between the two schools is among the more notable in NCAA Division I sports because both schools are located within the same city. The campuses are only 12 miles apart. The sheer proximity of both alumni and students, and the likelihood of encountering each other and interacting on a daily basis make this one of the most intense college rivalries in the United States. USC is one of the top teams in the country in college football, and recognizes 11 of its teams as National Champions. UCLA has only one team recognized as a National Champion.Quite often, the winner of the football game has won or shared the Pacific Ten Conference title in football. A berth in the Rose Bowl game has been on the line many times as well for both schools. Since the formation of the Pacific Coast Conference in 1916, USC has won or shared 37 conference titles and UCLA has won or shared 17 titles.Washington is third in overall conference titles with 15.Since the 1959 season, when the Pacific 10 Conference was formed as the Athletic Association of Western Universities, through the 2007 season, the schools have won or shared 33 of the 48 conference titles. USC has won 17 championships outright, shared eight and gone to the Rose Bowl or BCS bowl 21 times. UCLA has won six championships outright, shared five and gone to the Rose Bowl eight times. The schools have shared the championship between them three times. Both teams have spoiled conference and national championship runs for the other. USC was already an established national football power under Howard Jones and had begun a major rivalry with Notre Dame when UCLA joined the Pacific Coast Conference in 1929. Los Angeles Times Sportswriter Braven Dyer predicted on the day of the first football meeting on September 28, 1929, “In years to come, this game will probably be one of the football spectacles of the West” USC dominated the early games (so much so, that after the first two games, the series was suspended for five years and they did not play each other from 1931-1935) until UCLA established itself. By the late 1930s, star players such as Kenny Washington, Jackie Robinson, and Bob Waterfield enabled UCLA to be competitive. With the hiring of Hall of Fame Coach Henry “Red” Sanders, UCLA became the more dominant program in the 1950s, culminating in their 1954 National Championship. A famous quote was attributed to Sanders regarding the rivalry, “Beating ‘SC is not a matter of life or death, it’s more important than that.” But Sanders died suddenly of a heart attack, and shortly thereafter, John McKay took over a struggling USC program and returned it to national prominence. For most seasons from the mid 1960s to the end of the 1970s, the two schools were the top powers on the west coast. In the 15 Rose Bowls played from 1966 to 1980, USC or UCLA played in 12 of them. Even with the rise of Don James’ Washington Huskies in the 1980s and early 90s, UCLA or USC still went to the Rose Bowl seven times between 1981 and 1995. In the 1990s and until the hiring of Pete Carroll by USC, UCLA was the dominant team, winning 8 straight from USC from 1991-1998, before USC then won 7 in a row from 1999-2005. The 13-9 win in 2006 at the Rose Bowl allowed the Bruins to keep the record for consecutive wins in the rivalry. I have such little interest in this rivalry that I didn’t even bother to read over it for corrections. USC is playing Notre Dame during Rivalry Week this year. This rivalry played out last week with UCLA taking the win. Florida vs. Florida State is the next rivalry on the list. Not much going on here aside from state pushed interstate rivalry. here’s the history: The University of Florida has been fielding an officially sanctioned football team since 1906. Though Florida State University (then known as “Florida State College”) played football for several years around 1900, it became a women’s college in 1905 and remained so until 1947, when the football team was re-established. Almost immediately, pressure began building for the Gators to play the new team in-state. Some believe that it took an act of the Florida state legislature to force the contest to take place. 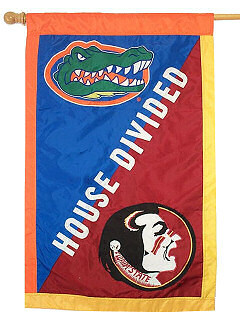 This is not exactly true – a bill demanding a UF vs. FSU football series was proposed in 1955 but was voted down. However, the schools bowed to pressure from state leaders and agreed to schedule a yearly series starting in 1958.One of the conditions that the University of Florida put on the agreement was that the contest must always be held in their home stadium, Florida Field in Gainesville. Since 1964, however, the game site has alternated yearly between the Gators’ field and the Seminoles’ home turf of Doak Campbell Stadium in Tallahassee. Rice and Houston are the next match up in their competition to take home the Bayou Bucket. The Houston–Rice rivalry (also referred to as the UH–Rice rivalry, Rice–Houston rivalry, or the Rice–UH rivalry) is a cross-town college rivalry between the University of Houston and Rice University. The universities are located approximately five miles from each other in Houston’s “Inner loop” area. It is one of the few NCAA Division I cross-town rivalries, especially between institutions that field Division I Football Bowl Subdivision teams. The rivalry has existed in a more official capacity since Houston joined the now-defunct Southwest Conference in 1971, in which Rice was a charter member. Since the breakup of that conference in 1995, the rivalry has continued. In 2005, Rice joined Conference USA, of which Houston was a member, and has again made the rivalry more relevant for conference titles as well. Football is the largest focus of the rivalry and is the sport in which the competition between the two institutions has run the longest. Both teams are part of the NCAA’s Division I Football Bowl Subdivision and have both been part of the Conference USA athletic conference since 2005. The competition includes an annual regular-season football game between the schools. It has existed since 1971, when Houston joined the now-defunct Southwest Conference, of which Rice was also a member. The winner of the game wins the Bayou Bucket. Houston leads this series 24–9. Although the last Southwest Conference football game was part of the series, the teams did not compete against each other in football from 1996 to 1998 as the universities realigned themselves with other conferences. Although the first official meeting between the teams in football didn’t take place until 1971, a scrimmage took place between the inaugural 1946 Houston Cougars team and the Rice Owls. The Owls, having played football since 1914 and being a part of the Southwest Conference, were a much more experienced and accomplished team than the Cougars. In a front of a crowd of thousands, the Owls easily defeated the Cougars. 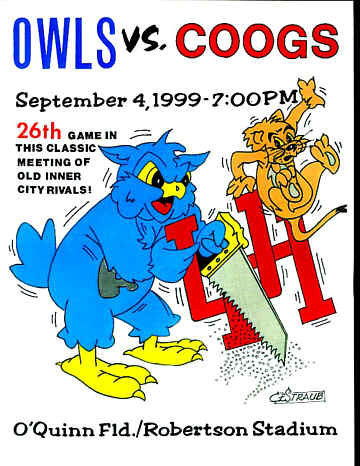 Made famous from football games between the two rivals, University of Houston students often wear red shirts with the words “Ruck Fice” to UH-Rice games. 5 miles apart from each other.. does that not say, “hey I wanna mess with you and take your recruits fans and basis of how you exist” to you? In the oddest rivalry game situation I’ve seen, These teams opened the 2018 season playing against each other. Houston took the win. Notre Dame and Stanford are next on the list. This rivalry is young and not really considered a major rivalry so there’s not much to it. The Irish have a minor rivalry with the Stanford Cardinal (for the Legends Trophy, a combination of Irish crystal with California redwood). The two teams first met in the 1925 Rose Bowl, then played each other in 1942 and again in 1963-64. The modern series began in 1988 and has been played annually except in 1995-96. Notre Dame leads the series 17-6. When the game is played in Palo Alto, it is usually the last game on Stanford’s schedule (as has been the case since 1999), one week after the Cardinal plays arch-rival Cal in The Big Game. This game was filled on September 29th. The Irish took the W.
I finish up with Arkansas and LSU in the Battle for the Golden Boot, an aged old tradition since 1996. I myself was unaware that this was even a rivalry, but I guess everyone needs a rival. Here’s the background on the two teams playing each other. The Arkansas–LSU rivalry, now known as The Battle for the Golden Boot, is the annual college football sports rivalry game between the teams of the University of Arkansas, the Razorbacks, and Louisiana State University, the Tigers. Although the first game between the two teams occurred in 1901, the rivalry between the teams intensified after Arkansas’ entrance into the Southeastern Conference (SEC) in 1992, and later in 1996 with the first awarding of the “Golden Boot” and the official titling of the game “The Battle for the Golden Boot”. The game is now generally played on the day after Thanksgiving. The two teams have played 53 times since 1901, and as of the 2008 contest, 17 consecutive times after Arkansas’ induction into the SEC. During that time, LSU has won 33 games of the series while Arkansas has won 19, including the latest meeting in 2008, between the two teams. Arkansas and LSU have twice ended the game in a tie, in 1906 and the 1947 Cotton Bowl Classic. Arkansas and LSU began playing each other in 1901, when LSU claimed a 15-0 victory in Baton Rouge, Louisiana. Between 1906-1936 (with the exception of 1918) and 1953-1956, the two teams played each other during regular seasons on a yearly basis. In addition, the two teams have played each other at the end of the regular season in the Cotton Bowl Classic twice, on January 1 of 1947 and 1966, the former being the second tie in the series while the latter ended in a 14-7 LSU victory. In 1992, LSU and Arkansas resumed their annual rivalry when Arkansas joined the Southeastern Conference after leaving the Southwest Conference. The teams played each other four times in the conference before the introduction of the Golden Boot trophy in 1996. Beginning in 1996, the victor in the rivalry between Arkansas and LSU received the Golden Boot, a trophy that weighs approximately 175 pounds and is generally considered the heaviest “trophy” awarded in all of college football. The trophy itself stands a little over 4 feet tall, is molded out of 24-karat gold, and resembles the outline of the states of Arkansas and Louisiana connected, thus making a boot shape. Since 1996, the game has been set on the day after Thanksgiving, and has been played on alternating years in Little Rock, Arkansas at War Memorial Stadium, which is the secondary home stadium for the Razorbacks, and in Baton Rouge, Louisiana at Tiger Stadium. The series has generally represented an important battle in the SEC Western Division, with either Arkansas or LSU representing the division in the SEC Football Championship Game in many seasons. LSU won the inaugural “trophy meeting” in 1996, 17–7, and for the next six years, the trophy changed hands every meeting, beginning with LSU in 1997. After Arkansas’ “Miracle on Markham” victory in 2002, LSU won the rivalry and the Golden Boot four consecutive times from 2003 to 2006. The trophy returned to Arkansas’ possession on November 23, 2007 when the Razorbacks beat then top-ranked and eventual BCS National Championship game winner LSU 50-48 in three overtimes in Baton Rouge; the victory was the first for former Razorback coach Houston Nutt in five tries in Tiger Stadium. Arkansas successfully defended the Golden Boot again in 2008 with a spectacular come-from-behind victory in the last minute of game play. 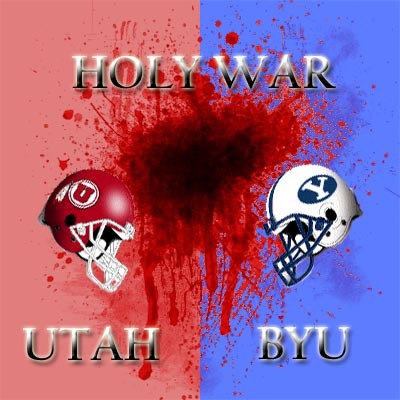 Like all other great rivalries since 2009 this one got changed. The addition of Missouri and Texas A&M to the SEC has caused some issues with scheduling. The Tigers played this game on November 10th. With the previous info on the Razorbacks I don’t feel the need to mention that LSU got the win in this one, but I will anyways. LSU took the W.
Reading back over these and taking a look at the schedule now has make me very sad for Rivalry Week. 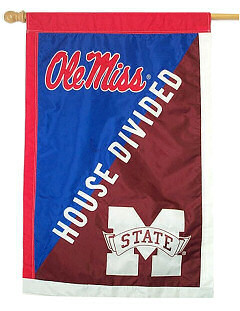 Since I live in my own bubble, my teams rivalry is still carrying on strong, so I assumed everyone else’s has. I don’t know if its because of Conference restructuring or scheduling for television, but it makes me sad for those who are not getting to participate in rivalry week because of scheduling conflicts. Enjoy football this week. Its probably the best week in football aside from that week in January when Alabama wins the College Football Playoff trophy. Roll Tide!